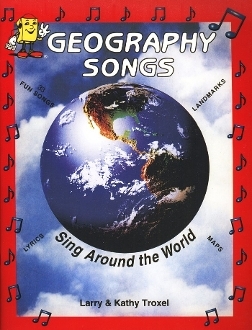 Australia Song mp3 Performance Track from "Geography Songs"
Greenland Sing-Along Video mp4 from "Geography Songs"
Northern Central Africa Song mp3 from "Geography Songs"
Scandinavia Song m4v Movie Download from "Geography Songs"
Scandinavia Song mp3 from "Geography Songs"
Solar System Song mp4 Video from "Geography Songs"
68-page book contains lyrics to 34 songs, landmarks, maps, tests, Geography Crossword. Reproducible for one family, group or classroom. Click on photo to see more. Updated 2014.